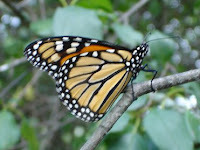 The caterpillar of the Monarch butterfly is a lot easier to photograph than its parent. There were two of them on what is left of this common milkweed plant in the hayfield. 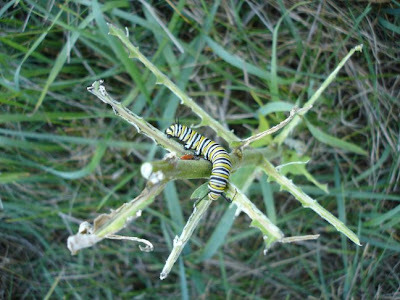 After I took this, I transferred them onto another milkweed nearby which had a few remaining leaves. Milkweed is the only thing that Monarch caterpillars can eat, so it is a desirable plant for people who want to encourage butterflies to their gardens, but it is considered a weed by farmers as it is poisonous to sheep. Identifying all the wild flowers we're seeing is sometimes easy, sometimes hard. I was surprised to see Golden Rod growing all over the place - it's generally seen as a weed here, rather than as a desirable cottage garden flower, as in the UK. I found this flower last night - initially thinking it was a thistle, but then on close inspection realised that it was an aster. 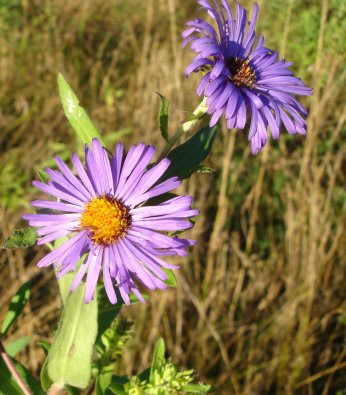 I think it is a New England Aster. 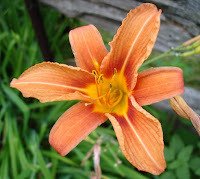 The Wikipedia article mentions that this is another wild flower that was taken back to Europe as a garden plant. 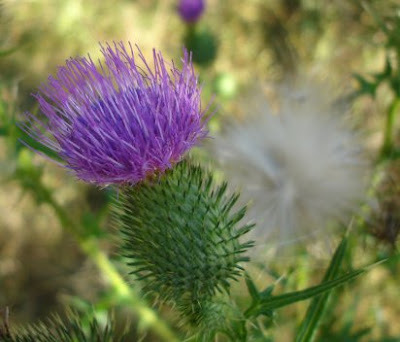 On the other hand, the Canadian Thistle seems always to be considered a weed, although I rather like both its flowers and its seed-heads. The butterflies love them too. The bright red berries of this plant caught my eye this when out for my morning constitutional with the dog (who, by the way, has been waking us up repeatedly during the night ever since I wrote about how good he is at night-time). Its delicate lilac flowers look like those on potatoes, so I presumed that, like the potato, it would be a North American plant. Wrong again - it is Bittersweet Nightshade, which is European and poisonous and highly invasive. It does have some uses in herbal medicine though, so it's not a completely hopeless case. This is the view of Prince Edward County that you get as you approach from the Glenora Ferry, a 10-minute trip that takes you from the mainland to the county. We all went to Kingston on Monday to register with the provincial health insurance plan (you have to be here for three months before being eligible for it). As we were going to be out of the house for a few hours we took the puppy with us. This meant that we didn't need to rush back, so instead of heading back along Highway 401 (a very boring dual carriageway) we decided to take the old road, Highway 33, marketed as the Loyalist Parkway. It runs alongside the lake most of the way from Kingston and then along into the County. Although it takes a bit longer, the route is far preferable to the 401 alternative. 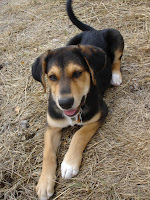 I've had a particular request for an updated picture of the puppy, so here he is. This is the 'Where's my treat then? Look I'm sitting down and everything.' pose. He is now house-trained and usually wakes us up to go out between 5-6am, which I hope will get later as the mornings get darker. He's still chewing anything he can get hold of with his needle-sharp puppy teeth - will be glad when he finally gets his adult set. He lives on the ground floor and doesn't venture up or down stairs (yet). I must admit that it's quite heart-warming to see how pleased he is to see you in the morning - his whole body wags! I went to Deseronto last night to talk to the Archives Board about priorities for the next few months for the archives. I was handed the keys to the room in the library that serves as the current archives and, as the meeting ended, I met the Mayor and the Deputy Mayor of the town. The latter looked at me and said 'I was expecting somebody older'. So that's nice - I still look too young to be an archivist. Thought I'd moved on from that! So I start work there next week - I suggested that I would do one day a week and they seemed happy with that. I drove back as the sun was setting - more lovely views of Lakes Ontario and Consecon. The drive takes the same length of time as my commute into Manchester did, but the contrast in terms of traffic and scenery couldn't be greater. 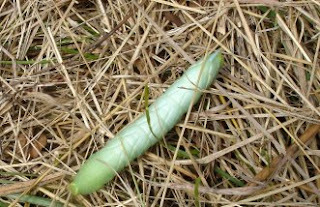 Spotted this huge green caterpillar on our walk up to the field with the dog this afternoon. It is about the size of a cigar and was moving very quickly. Mike discovered that it's a Waved Sphinx moth (or will be, next year), and it was heading off, having feasted on our trees, to find somewhere to pupate. We now have six vegetable plots dug over and sown with buckwheat. There are seedlings appearing on the plots I sowed first, but whether they are buckwheat plants or something less desirable I can't yet tell. OK, so the grass in the barnyard that I naively thought was just an extra-strong, butch Canadian version of ordinary grass - isn't. Anyone who's had to deal with couch grass would have recognised it straight away, except that here the preferred term seems to be quackgrass and it is defined by the provincial government as "one of the most difficult weeds to control". I'd never had to deal with couch grass before, so didn't realise that was what it was until tipped off by my aunt. So, far from being a native Canadian type of grass, this stuff is, like me, a European interloper. Quackgrass seems a ridiculous name for such an invasive and pesky plant, but perhaps it is a corruption of 'quickgrass', which is one of its other names. Actually I think the most appropriate of its many names is devil's grass. I'm fairly sure that sinful gardeners would spent their time in Hell dealing with an infinitely large field of the stuff. Well it's early afternoon and at last we've had some decent rain showers. According to our weather system 9.6mm has fallen so far today. This translates into a gain of 3 inches of rainwater in our cistern. Yes, sorry about the mixing and matching of measurements - we've got a home-made measuring stick marked in inches for the cistern (fewer lines to draw than if we'd marked it up in centimetres), but have attempted to modernise by measuring everything to do with the weather station in metric units. I think we come from a generation which is completely confused about systems of measurement and Canada seems to be just as confused as the UK, but often in the opposite direction. It doesn't help when they call Imperial units 'English'. I've had to stick a small concordance table of oven temperatures in °F and °C in one of the kitchen cupboards, which I check frequently, as this oven is calibrated in Fahrenheit and I'd got used to Celsius in England. On the other hand I do quite like having the road signs in kilometres, as subconsciously you read them as miles and journeys seem to go more quickly (which is necessary when the speed limit is only 50mph, sorry, 80kph, most of the time). Since we put the weather station up on 6 August and until today we'd only had 7.6mm of rain - about one third of an inch - in nearly three weeks. And there hadn't been much before we started measuring it either. Our lawn is completely brown and a lot of the trees are beginning to show signs of stress - the poplars are losing their leaves rapidly and the leaves on some of the smaller ash trees are turning brown. The rain is particularly welcome as on Tuesday evening I sowed some of the buckwheat seed in the two vegetable plots that we'd created by then, so this might give it a fighting chance of germinating. 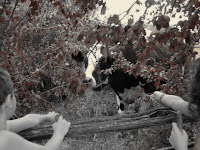 It's been a frenetic few days in the barnyard. The tree surgeons came on Friday and Mike helped them carve up the poplars into manoeuvrable chunks which can then be split into logs for the fires. 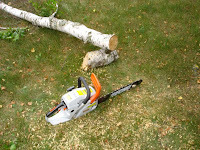 They also cut down the branches of the ash tree that were resting on the roof at the back of the house. This has had the added benefit of preventing the squirrels from getting on to the roof and into our roofspace (for the moment anyway). 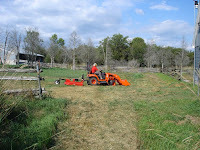 The rotary tiller attachment for the tractor turned up in the afternoon and we spent an hour or two getting it fixed on during Saturday before we could start using it. I'm glad Mike's got a background of working with machinery because I wouldn't have had a clue how to fix it all together. My role on these occasions is solely as moral support, or more likely, irritatingly curious bystander. Once the thing was fixed on, Mike used it to till Barnyard Two. It was pretty effective - tearing the grassy soil up into big lumps. Lots of stones came to the surface and we removed the biggest ones. Before tilling the area looked like the grassy strip on the right of the photo. Yesterday I was finally able to do some of the work myself. 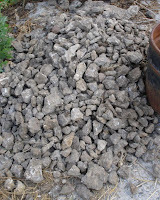 I started by clearing more stones from the western end of the yard. I persuaded the children to help me and they picked stones with me for half an hour, pretending that we were a pioneer family. Then they realised that being a pioneer family wouldn't actually have been much fun and they went off to play Top Trumps instead. 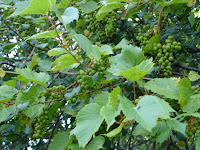 When I'd cleared the biggest stones I marked out the boundaries of my first vegetable plot, an area ten feet wide and 15 feet deep, and proceeded to rake it clear of big clumps of grass and more stones. 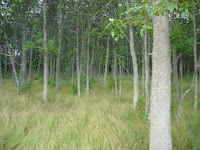 The grass roots are long single strands, rather like thick noodles in size. The rotary tiller has left many of these in the soil so I had to pull them gently out by hand as my experience in the front garden has shown that the grass will re-sprout from these roots very readily. 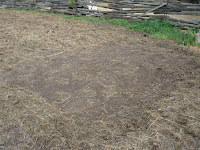 I spent about five hours raking, de-stoning and de-rooting the area yesterday and I think it's now ready to be seeded. 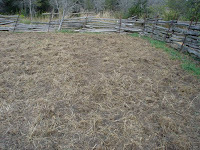 My plan is to sow buckwheat as a green manure (I ordered two kilos of seed last week) in the vegetable plots. I might be cutting it a bit fine, as it will be killed by the first frost, but it is supposed to be very quick to grow so I'm hoping it will work. The soil is so fine that leaving it bare seems like a really bad idea. The picture shows the finished plot, although I know that it actually doesn't look very different from the 'before' picture. Even this one plot is twice the size of the raised beds I had for growing vegetables in the old house. There will be eight vegetable plots in all in this part of the barnyard - and by the time I've cleared all eight I expect to be super-fit and as thin as my rake. Charlie the tree climber and his mate came this morning and took down the two poplar trees ('widowmakers' as Charlie called them). Bill will turn up tomorrow to cut the trunk into smaller pieces, which will eventually end up in our woodburner. Someone finally came to take our hay bales away this morning too. There were 40 of them in all. We're getting obsessive about watching the weather radar and calculating how soon it will be before we get rain and how long it might last. At the moment we're down to nine inches of water in our cistern, which is effectively only four inches if you take off the width of the outlet pipe. Both wells are dry so I'll be trying to learn how to do a rain-dance soon. Thought I'd better post an update on our smelly water situation. Here's a picture of the solution to the problem. The white unit is our filter, which takes out any solid particles in the water. 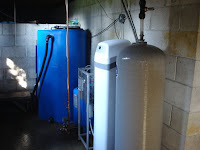 Next to it, on the left, is the reverse osmosis unit, which subjects the water to high pressure and forces out the dissolved solids which make the water hard. It's been two weeks since the system was installed and it has taken that long for the hot water tank to finally be free of the old water and the sludge that had built up in the bottom of it. So now we've got lovely clear, non-smelly water and there are no excuses for the children not to have a bath. Well, apart from the ongoing lack-of-water scenario, that is. One thing that has helped us conserve water a bit is our new washing machine. You can't tell from the picture, but it is huge. It holds at least twice as much washing as our old machine in the UK, so I'm having to run it half as often. 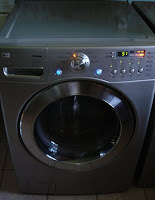 I know it's a very dull and mundane thing to get enthusiastic about, and this may be a reflection of how quiet my life is now, but I actually look forward to doing the laundry so that I can use it - it's got neat little sound effects, whizzy lights and a countdown feature which make it seem quite space-age. There's a matching tumble dryer too, but I haven't used that yet and hope I won't have to for some time. Thanks to the voltage difference we've had to buy loads of electrical devices on moving here. In time we'll be able to preserve our house as a museum of the Canadian home in the year 2007. Well OK, it's not quite a combine harvester, but our mini-tractor arrived today and Mike's already tested it out on the grass of Barnyard One, the route into the woods behind the big barn and the grass around the house The thing on the back is a heavy-duty rotary cutter which is suitable for cutting down rough grass. There's a lawn mower attachment underneath the tractor for shorter grass. So basically what he achieved in a week or two with the strimmer in the barnyard has taken about 20 minutes with the tractor and its attachments. That's impressive. We'll be getting a rotary tiller attachment to go on the back too, but they didn't have it ready to deliver today. The same was the case with the snow blower attachment, but I'm rather hoping we won't need that in the next few weeks. It's a relief to finally have the grass cut - we've been in the house nearly seven weeks without having the tool for the job. 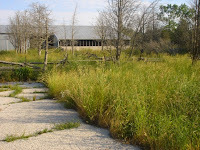 The lack of rain, while problematic for our water supply, has at least stopped the grass from growing too much (although there were some pretty beefy weeds). 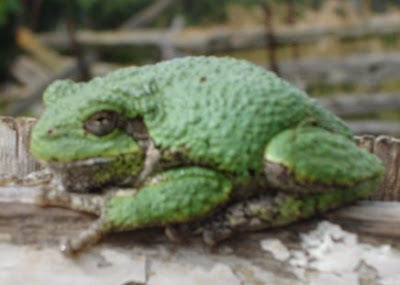 ... for guessing the name of this frog. Yes, you've guessed it: Lithobates clamitans. It was having a nap on the inner side of the barn door this morning when Mike went out there. Quite nice to see a live frog for a change: the dog has developed an uncanny instinct for finding dried up dead frogs and using them as puppy chews. I've only just got over a phobia of dead insects and now I'm having to get used to extracting dessicated frogs from the dog's mouth. Urgh. I continue to be impressed by Mike's ability to turn his hand to new skills. Today was his first go at using the chainsaw that he bought last week. It's been fairly overcast, so not quite as hot as it has been of late. 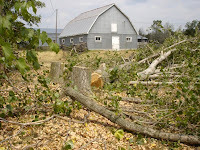 He started off by removing a dead bough from the Silver Birch in the front garden, then progressed to cutting down some of the dead Eastern Juniper (aka Red Cedar) trees in the barnyard (I'm assuming that they were killed by the cows that used to be housed there). He's made a good start on our wood supply for the winter. 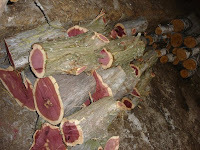 I love the colour of the freshly-cut red cedar logs - they look a bit like cartoon depictions of legs of ham. The tree-climber member of the tree surgeon's team which will be cutting down the poplars came round earlier and they'll probably be bringing those down later in the week, so that will give us even more wood, although poplar doesn't burn particularly well, so it might be better to leave that for a while to season. My new bible, John Seymour's New Complete Self-sufficiency: The Classic Guide for Realists and Dreamers agrees with most other sources that ash is the best wood for burning. There's an ash coppice up by the pond, so we're well set up in that respect. According to John, if you cut the trees down at a diameter of nine inches, they'll regrow and be ready to cut down again in 12 years' time. Sounds ideal to me - then you don't feel like you're destroying something. Managed to get a photo of a Monarch at last yesterday evening, on our walk up to the hay field. Apart from its size, the main difference between it and a Viceroy is the lack of a black vein cutting across the lower wing on the Monarch. Today's fairly substantial job was to put up our weather station. As we're planning to generate our own energy from the wind and the sun, it is going to be useful to have some record of the amount of both that we can expect here. Mike decided that we should put the anemometer as high up as possible, so we had a 30 foot pole to put up. We started by digging a big hole at the back of the small barn, then attached the anemometer to the top of the pole and the weather station a bit further down. The pole was very heavy, but Mike managed to get it into place and then attached it to the edge of the barn roof with two brackets. We concreted the base of the pole into its hole and the entire edifice seems pretty sturdy now. The weather station transmits information to a data logger which is attached to my PC and downloads every 15 minutes. 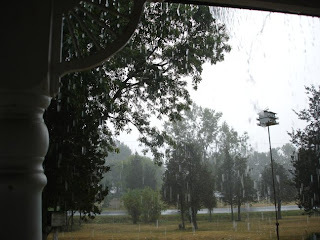 It's really neat - measuring sunlight, wind speed and direction, amount of rainfall (I wish! ), temperature, humidity, UV, well, you name it really. You can get various views and reports of the data, with the ability to upload it to a website. The main weather display is a bit lurid (and looks like it hasn't been updated since about 1995) but it gives you a useful summary of the current conditions. P.S. Finally got the upload sorted out - you can see the weather we're having at the Weather Underground site. P.P.S. And now there's a weather station sticker on the blog too. I love this stuff - such a geek! The last two days have been really hot and humid, so yesterday evening we decided to head for the beach. 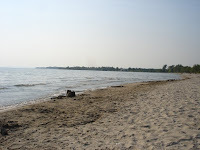 North Beach is our nearest Provincial Park, 10 minutes' drive away. We got there at 5pm and I suppose there may have been a total of 50 people on the beach, which is a natural sandbar about a mile in length. The water of Lake Ontario was really warm (which was not the case a month ago, when we first visited the park and only the kids braved the water), so we all went for a swim. You have to pay to get into the park ($11.00 per vehicle per day), but you can get a seasonal pass for $80 (about £10 each for our family), which represents good value and ensures that we go there regularly! We couldn't get over how quiet the beach was - contrasting it with any sandy beach on an August evening in the UK when the temperature is hitting 28°C (82°F). We also realised that we'd never all been swimming off a beach at the same time before: in the UK one of us always ended up sitting on the beach because we'd be worried about people nicking our car keys/money/phones. We had no such worries last night and it was really liberating. The only strange thing is that you're swimming in fresh water, when the lake is so big that it feels like you're at the seaside. Last Wednesday I had an interview for the post of part-time archivist at Deseronto, a small town about 40 minutes' drive from our house. The town's previous archivist had been based in the library, looking after various deposited collections and he retired in March. The town council is anxious to make proper provision for its municipal archives (indeed, is required by law to do so), which had not previously been part of the archivist's responsibility. They are currently held in a very dirty vault in the basement of the Town Hall (which was once a bank) and nobody really knows what's down there. Today one of the (five!) Town Councillors rang me up to offer me the job (assuming my references are acceptable). I had been a bit unsure about whether to even apply for the post, but now that I've seen the place and the sorry state of things there, I can't turn it down. It'll be a challenge! I've noticed that many of the people who live here have more than one job (a bit like Local Hero or Northern Exposure). Well this will bring my number of current jobs up to three, so I feel like I'm integrating nicely. This will be my first local job though - which I think will be a good thing, as I will be working with and getting to know people who actually live here. There is a slight danger that I'm now taking on too much, so I'll need to be very careful about allocating my time, but we'll see how things go.